Vin Singto, (second from left), THAI’s new sales manager for Upper Northern Region, succeeding Mr. Thanawat, (third from right). Chao Dungduen na Chiangmai, Chairperson of Chiang Mai Cultural Council, (center), surrounded by friends at the recent party. Thanawat Hiranyalekha, manager of Thai Airways International sales office, Upper Northern region in Chiang Mai has been promoted to the position of Manager of Thai Airways in Indonesia. 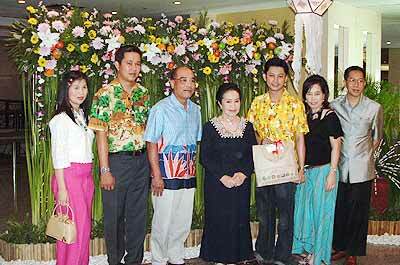 Friends and colleagues of Thanawat organized a party at the Central Duangtawan Hotel to celebrate his promotion. A slow serene cruise down the Kwai aboard the RV River Kwai. There is no better way to expose yourself to the majesty of the Kwai Noi River than aboard the RV River Kwai, the first inland cruise ship in Thailand. Based on the designs used by the original Irrawaddy flotilla, founded in Myanmar in 1865, the newly built ship allows you to enjoy the river in luxury. Its 10 stylish air-conditioned teakwood cabins – each fitted with two single beds and a bathroom – offers a four-day/three-night cruise exploring the Kwai Noi River. With accommodations for only 20 passengers, each one is given a high level of personalized care. She journeys upstream for four days and three nights from the upper reaches of the Kwai Noi River in Kanchanaburi province, western Thailand, to the shadows of the fabled Three-Pagoda Pass on the border with Myanmar. There is also a four-day downstream cruise from Daowadung Bridge, some 70km north of Kanchanaburi Town, to the Mae Klong Dam, a seven-day cruise and golf cruises (a different course is played each day). The top deck, three-quarters covered by a canopy, has a bar, dining area and ample room for passengers to relax. 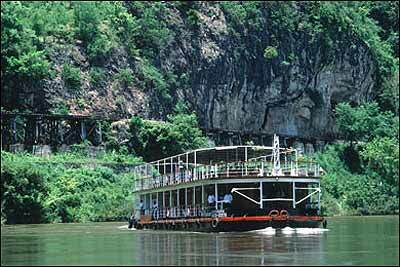 There is an old world opulent charm about the vessel that is in keeping with the river. Relaxing in a deck chair sipping champagne, we passed homes on the banks of the river that are a throwback to another time. I visited the Hin Dad Hot Spring, which was discovered by Japanese soldiers during the war, a Mon village, where local students welcomed us with a song, an elephant farm and the famed Tiger Temple, where the only thing standing between me a fully-grown tiger was a 60kg monk wielding a bamboo cane. You do not have to go on the excursions. The highlight was the many hours spent in my favorite deck chair. I especially loved it at night, when memories of the bustle of Bangkok dissolved in the face of total serenity on the river. The German-Thai Chamber of Commerce has unveiled a major lifestyle travel exhibition targeting wealthy Thais. The inaugural Germany: Lifestyle & Travel 08 will be staged at Central World Hotel and Bangkok Convention Centre in November next year to promote lifestyle products in Germany’s south, home to high-performance Porsche cars, wine regions and deluxe hotels. Airline alliance oneworld is adding several new members to its network from April 1. Apart from Japan Airlines and five JAL associates joining as affiliate members, Royal Jordanian Airlines becomes oneworld’s first Middle East member. As part of its new luxury product strategy, Qantas is introducing a new designer amenities collection, by famous Australian industrial designer Marc Newson, to first- and business-class passengers. A sharp drop in arrivals from East Asia, Thailand’s largest source of tourists is worrying the trade despite healthy growth in bookings from Europe this year. In January, the number of arrivals from East Asia dropped by 7.34 per cent compared to the same month last year. Hong Kong is reported as the most affected market with a decline of 43.38 per cent, followed by China with 28.74 per cent, Vietnam with 27.52 per cent and Singapore with 21.90 per cent. Tourism Authority of Thailand (TAT) governor, Ms Phornsiri Manoharn, said these markets were sensitive to safety issues, and attributed the drop to setbacks that continued to affect the Thai tourism industry since last year, including the New Year’s Eve bombings in Bangkok. “The market share of arrivals from Europe is just 25 per cent of the overall tourists to Thailand so I am worried about the drop in arrivals from East Asia,” Ms Phornsiri said. Last year’s 7.6 million arrivals from East Asia represented a 55.15 per cent share in the total 13.8 million tourist arrivals to Thailand. This was an increase of 19.15 per cent over 2005. Pathumwan Princess Hotel general manager, Mr Supanit Vimooktanon, said during the first three months, the hotel suffered a four to five per cent drop per day in corporate arrivals from Singapore, while the tourist segment suffered a slight decline. Singapore arrivals represent more than 20 per cent of the hotel’s business, and growth is not expected this year. TEZ-Tour managing director, Mr Thongyoo Suphavittayakorn, said besides Hong Kong, China and Singapore, Thai travel agents had also experienced a 10 per cent drop in the Japanese market. He said it was high time all concerned government agencies, not only the TAT, exercised better crisis communications on all situations and events deemed to have negative impact on tourism. The Tourism Authority of Thailand (TAT) is going ahead with its plan to open three new offices in Dubai, Moscow and Ho Chi Minh City by the end of its fiscal year for a total budget of 20 million baht (US$627,185). TAT has 18 offices in Asia-Pacific, Europe and North America. Governor, Ms Phornsiri Manoharn, said the new offices in Dubai and Moscow would bring in more high-spending tourists from the Middle East and Russia and the Ho Chi Minh City office would tap expatriates in Vietnam. TAT executive director for Europe, Mr Satit Nillwongse, who is responsible for the opening of the Dubai and Moscow offices, said TAT had been in discussions with Middle East carriers – including Etihad Airways, Emirates, Qatar Airways, Gulf Air and Royal Jordanian Airlines – to promote Thailand through their networks. He said TAT was also seeking partnerships with airlines to organize at least two familiarization trips this year for some 20 travel agents and media from the Middle East. In addition, TAT staged road-shows in Saudi Arabia and Iran the first week of April. It will also participate in the Arabian Travel Mart in Dubai between May 1 and 4, and the International Health Tourism fair in Bahrain in December. With the new office openings and aggressive tourism marketing activities, TAT expects to increase arrivals from the Middle East by 20 per cent this year. Last year, Thailand received 392,416 arrivals from the Middle East, a 34.13 per cent increase over 2005. Emirates area manager for Thailand and Indochina, Mr Jeyhun Efendi, told TTG Asia the opening of the TAT office in Dubai would mean more business for Thailand. “Passenger traffic from the Middle East to Thailand is growing as travelers from the region are exploring more of Asia,” he said. Qatar Airways area manager for Thailand and Cambodia, Mr Rohan Seneviratne, said the airline had been promoting Thailand in the Middle East for the last few years. “Many trade shows, familiarization trips and road-shows have been organized by Qatar Airways (to promote Thailand) and will continue this year as well. In addition, we have opened Qatar Airways Holidays offices in many countries and Thailand has been one of the top destinations promoted by us from the Middle East,” he said. Mr Seneviratne added Thailand was one of the top tourist destinations for the Middle East market. Mr Nillwongse said TAT would leverage on the wealth of Thailand’s spas, shopping and medical treatment options when promoting the country in the Middle East.